Steel shaft and fiberglass ribs: ribs are made from heavy-duty materials to ensure they will defy wind stresses, rain, hail, snow, sleet, or the hot sun. Cushion grip handle: ergonomic handle provides comfortable grip for both left and right-handed users and fits into most hand carry travel bags. 95% UV ray blocking: sun blocking UV coating reflects heat away from you to cool you down. quality polyster material canopy with resin coating protect you from inverting during hot sun, storm or high winds. Lightweight design: makes it perfect for both men and women. Don't hesitate to contact us if you are not 100% satisfied with the purchase, customers can get refund or exchange in case the purchasing is not satisfactory for any reason. FOR SUN & RAIN - The canopy cloth with a layer of UV and water blocking coating, this sunshade umbrella is able to block 95% UV ray and protects you well from the heating sun and any expected downpours. Deilin sun umbrella keep you cool in the sun and safe in the rain. Waterproof coating make it dry quickly and you could just put it back into bag in short time after use. PORTABLE AND LIGHTWEIGHT - Elaborate craftsmanship makes this mini umbrella weigh only about 6 oz. Mini design allows this compact umbrella short enough (6.7 inch) to fit perfectly in your bag. 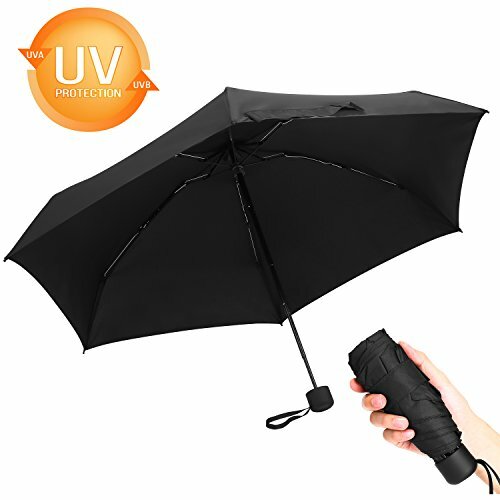 Light and small, this sun umbrella is the perfect combo of portability, protection and durability. Keep it in your briefcase, backpack, or luggage. WIND RESISTANT & WATERPROOF - High quality design built to last and withstand the strongest winds. The fiberglass rib plus a mental shaft endow this umbrella with the ability to withstand in the normal heavy wind and rain. Waterproof, weatherproof and instantly dry. It won't easily to flip out inside like most other mini umbrella do. STURDY & SMOOTH DESIGN - Strong aluminum center pole and durable ribs withstand winds and prevent the umbrella from flipping inside out. The non-button design ensures your finger not be hurting when close it.Easy to open and close without much strength needed. Made of six-rib aluminum alloy come with a mental shaft, this travel umbrella is well constructed for you to use smoothly. Closing and opening is manual while all work in a swift and easy motion. If you have any questions about this product by Deilin, contact us by completing and submitting the form below. If you are looking for a specif part number, please include it with your message.